Education Secretary Betsy DeVos hasn't been afraid of controversy. 2017 was a turbulent year for the federal Department of Education — an agency that oversees education policy for around 50 million kids nationwide. Before Trump even swore the oath of office, his nominee for secretary, Betsy DeVos, seemed to flounder through her confirmation hearing. In a testy exchange with one lawmaker, she apparently confused the terms "proficiency" and "growth." During another, she appeared unaware of a federal civil rights law protecting students with disabilities. 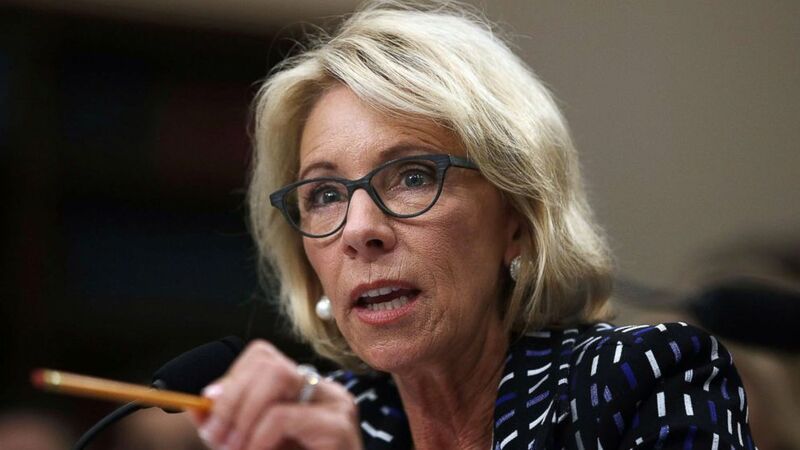 And in perhaps her mostly widely ridiculed comment to date, she suggested that guns could be allowed in schools to ward off "potential grizzlies." (Alex Wong/Getty Images) Secretary of Education Betsy DeVos testifies during a hearing before the Labor, Health and Human Services, Education and Related Agencies Subcommittee of the House Appropriations Committee May 24, 2017 on Capitol Hill in Washington, DC. But DeVos' headaches didn't end with her confirmation, which marked the first time a vice president has ever broken a tie to confirm a Cabinet nominee. For weeks after her swearing-in, the secretary was hounded by protesters at routine appearances. Critics' consternation only intensified when, just five months into her tenure, DeVos met with so-called "men's rights" groups, including organizations that purport to speak on behalf of accused rapists, to discuss Title IX sexual assault procedures on college campuses. The meeting, department press secretary Liz Hill later explained, was part of the department's commitment "reducing the federal footprint in education," and "rolling back overreaching regulation implemented by the previous administration that may have been well-intended but that lead to far-reaching consequences." So, the administration rolled back Obama-era guidance that had directed schools to use the "preponderance of the evidence" standard of proof in sexual assault investigations -- a relatively low standard DeVos said denied alleged perpetrators due process. "No student should feel unsafe ... and no students should feel like the scales are tipped against him or her," the secretary told reporters. "Every student accused of sexual misconduct must know that guilt is no predetermined." In a similar move, the department also withdrew guidance instituted under Obama that directed schools to allow transgender students to use bathrooms that match their gender identity. Bathroom policy should instead be decided "at the state level," the administration said. DeVos called the Obama guidance a "very huge example of the Obama administration's overreach." Overall, the department says, their aim is to "first and foremost empower parents -- those closes to students -- with a menu of good education options," using a "21st Century approach to 21st Century challenges," according to Hill. In the first eight months of the Trump administration, the department lost nearly 8 percent of its workforce, according to government data. When Trump took office, the department boasted more than 4,400 employees, Office of Personnel Management records show. By September, they were down to 4,055. 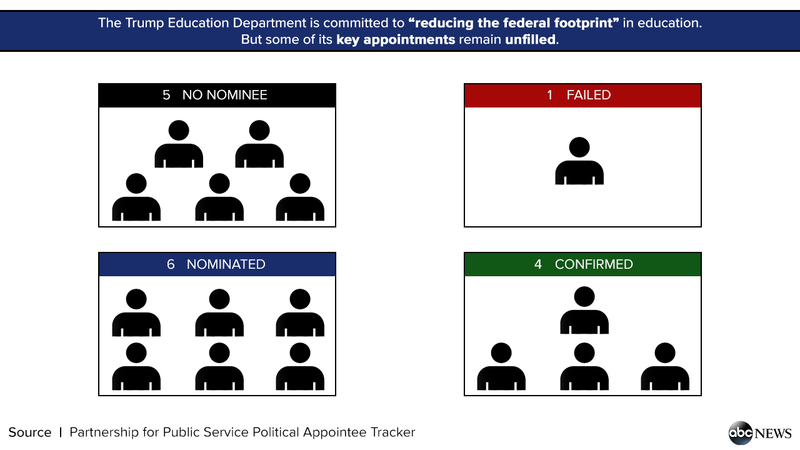 And according to the Partnership for Public Service, a nonpartisan nonprofit, the administration has yet to even submit nominees for eight of the department's 15 key positions.